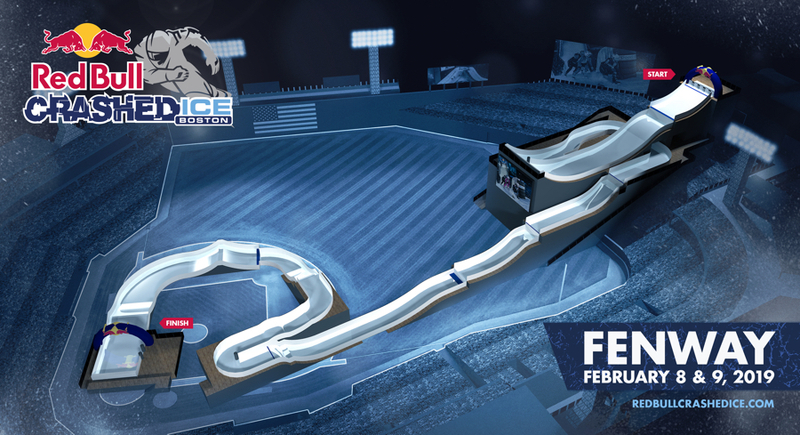 Red Bull Crashed Ice, a bonkers and wildly fun downhill race on ice skates, is coming to Boston’s Fenway Park. The two-day event on February 8-9 is part of the Ice Cross Downhill World Championship, a winter activity that dates back to 2001 and has been dubbed the “fastest sport on skates.” And for good reason: Competitors clad in helmets and pads fly downhill four at a time around curves, bumps, and jumps at speeds of up to 50 miles per hour, often slamming into one another in the process. Tickets for the go on sale September 19 at noon. This is only the latest Red Bull event to take place in the city. The energy drink company’s gaming, cliff diving, and Flugtag competitions have also found a home here in recent years. Next weekend, Red Bull is holding its Rubik’s Cube World Championship at the Cyclorama. Fenway has also shown it’s more than up to to the task of morphing into a winter sports destination in the off-season. Back in 2016, it hosted a giant Big Air course for snowboarders and skiers, an event that featured a 140-foot-tall slope of snow.